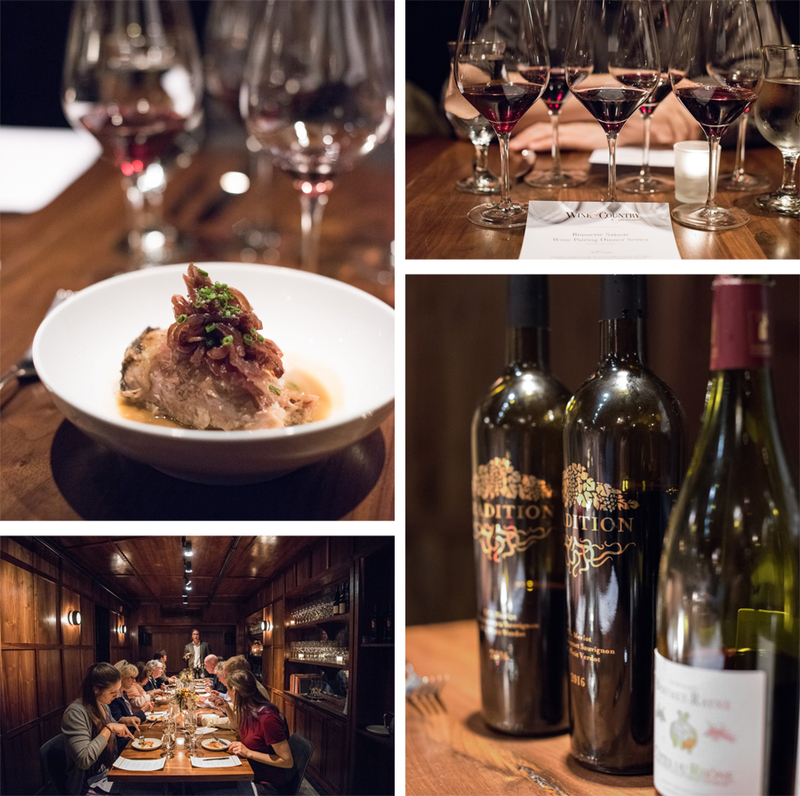 Last night, our new Food & Wine Pairing Series continued with an intimate wine-paired dinner at Brasserie Saison. The affair was held in the restaurant’s private Library Room, a cozy space that harkens back to old England with its wood paneled walls. The evening began in The Coat Room, where guests sipped Prosecco and mingled. 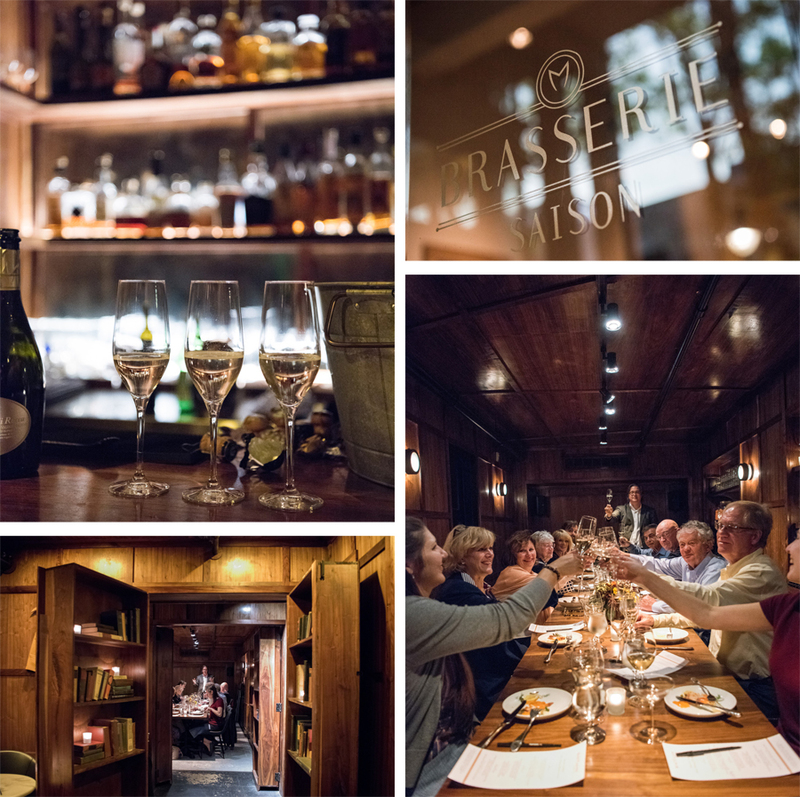 Once seated in the Library Room, Sommelier Will Curley with Brasserie Saison took the head of the table with guests filling the seats along the farm table. The menu and wine selection were created with the upcoming holidays in mind. Throughout the evening, Curley introduced each wine as it was presented, explaining the characteristics of each selection, as well as how each best pairs with foods. The meal was carefully created for the Charlottesville Wine & Country Experience by Chef Tres Pittard and Curley. For the first course, guests enjoyed Gravlax, a Nordic dish of thinly sliced raw salmon, topped with fennel, dill, lemon and caper. This dish was paired with three sparklings: Royal Provence “Rivarose” Sparkling Rose, Domaine Bergerie “Crémant de Loire” Chardonnay/Chenin Blanc and Laherte Freres “Ultradition” Champagne. During the second course, guests enjoyed braised pork served in Sauce Robert, a brown mustard demi-glaze, and garnished with red onion confit. Curley selected three reds to pair with this dish: a 2016 Afton Mountain Vineyards “Tradition,” Berthet-Rayne Côtes du Rhône and a 2015 Domaine Matrot ‘Maranges’ Burgundy. Guests finished the dinner with a pumpkin pie waffle served with foie gras and roasted figs. This was paired with Afton Mountain Vineyards‘ “VDN” Port-Style Vin Doux Naturel. After dessert, guests were joined by Chef Pittard, who shared some insights about the evening’s selected dishes and answered questions. 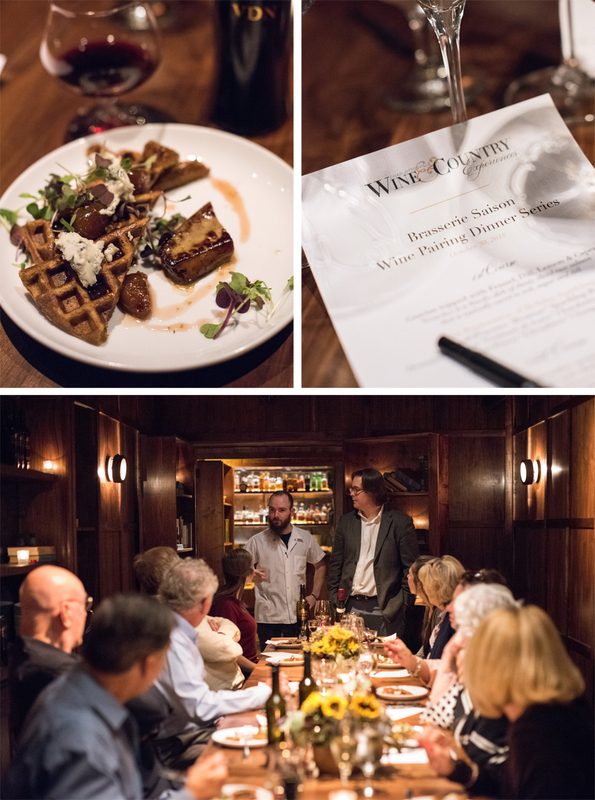 We had such a wonderful time working with Brasserie Saison and Sommelier Will Curley on the first wine-paired dinner in our new series. 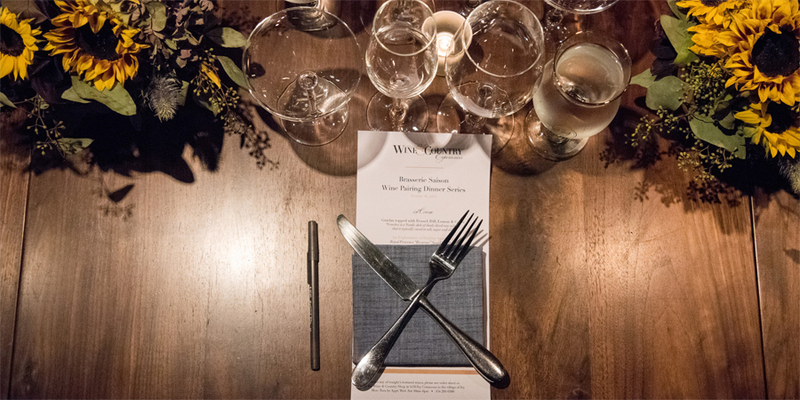 We cannot wait to see the menu they prepare for our next dinner in November, which will also feature guest winemaker Emily Pelton of Veritas Vineyard & Winery. You can learn more about our Food & Wine Pairing Series here, and find the upcoming dinner classes below!